We have an interesting interview with Mike Sieb - President of International Lithium Corp. Insiders are only buying this stock and Chinese partner apparently has spent 9 months doing DD on this company. We are looking forward to the announced drill campaign at Mariana Lithium and Brine project in Argentina now. With 2011 coming to its end we would like to share these days major events from this year which will be defining our future. This future will be uncertain and unknown, but we can grasp the major trends already. It will be about the Energy Transition. This transition is not something that we just would like to do, but it is the only way to survive - it is what we have to do. We still can try and reverse the inevitable economic collapse and stop the Power Transition and biggest Wealth Transition in the mankind history. The Peak Oil Crisis: The Energy Trap: US gas bill to reach a new high of Half a Trillion this year. Power goes to those who control Oil and our money goes to them as well. Do not believe that America does not have Energy Policy - it is very simple - To Get The Oil By Any Price. We all are paying this price. It is time to make the change, it will happen anyway, it is happening already. Shift of Power on geopolitical scale, ground based movements and calls for "Springs". We will all win if this power will go to create something new, not just to destroy. Big boys can not afford to live like nothing is happening any more, we need just to push them to accept that we know and demanding change and "lead" us in the "right direction. We are reaching the tipping point - it is impossible to hide the truth about the real Price of Oil and influence of Oil on all aspects of our life. We are doing our part here and need your help - share this information with others. You can have the different solution - talk about it. Share it with us. We have found ours - Electric Cars and all New Energy industry related to it. We call it Next Big Thing. We are investing in these companies, we are talking about them, we would like to be the part of this new Change. With all "downsides" of this new technology - which is advancing very rapidly - we have the solution to Pollution, Peak Oil and Energy Security Today. We call for another "Manhattan" project here - if all resources were allocated to solving this problem this transition to Electric mobility could happen within few short years. Just consider trillions of dollars spent on wars and billions on protection of Oil line supplies. Who will be Steve Jobs for Electric Cars now? R.I.P. and Thank you! "We need the Manhattan project for the Electric Cars in our broken society and we need it right now - who can lead the world into the future? Electric Cars industry gives Trillion market place business opportunity to fill. And we will throw again as with Apple iCar - Why Not?" Some people would like to remind us all the time that Electric Cars are "not clean" and that renewable energy comes at a price. We would like to share this great website with all of you. BMW is very serious now with promotion of its Electric Cars - we do hope that they will take out this market by storm! Visit BMW i website for the latest videos and further information. We have seen this TV ad with Nissan Leaf - now Renault is marketing its Electric Cars in Europe. "With 2011 coming to its end we would like to share these days major events from this year which will be defining our future. This future will be uncertain and unknown, but we can grasp the major trends already. It will be about the Energy Transition. This transition is not something that we just would like to do, but it is the only way to survive - it is what we have to do. We still can try and reverse the inevitable economic collapse and stop the Power Transition and biggest Wealth Transition in the mankind history." 2012 promise to be the real tipping point for the Electric Cars: Renault promise to make an Electric Revolution in Europe and Opel Ampera will be rolling out there as well. Better Place is testing markets in China with its battery switching stations and will move further in Israel, Europe and Australia. Our Lithium Juniors will have the new life in 2012 once more and more people will be able to see Electric Cars in action. Tax loss season will be over this week and will provide another catalyst for the stocks in Canada. 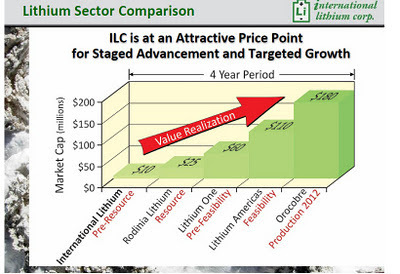 "We have an interesting interview with Mike Sieb - President of International Lithium Corp. Insiders are only buying this stock and Chinese partner apparently has spent 9 months doing DD on this company. We are looking forward to the announced drill campaign at Mariana Lithium and Brine project in Argentina now." It still remains to be seen whether Better Place can establish itself in China as a business or Chinese companies will "adopt" Better Place idea themselves - in any way development of this technology in the huge potential market for Electric Cars in China is very promising. "Looks like Better Place is back in the game or at least they are raising money again. Recently there was a total mass media black out on this company, but apparently it is still moving forward. Big boys are taking their seats in the Next Big Thing - Electric Cars. Among investors in this round are UBS and GE. Better Place has made the largest order in the history of Electric Cars for 100,000 of Renault Fluence ZE. Now the company has the cash for the down payment and its ambitious plan for the switching stations. Connection with China will be very interesting to watch: whether Chinese will allow Better Place for a market share there or will just push them to share technology and go forward alone. Stakes in this game are getting higher and it is still under the radar screens of the most investors." Better Place, the company that wants to swap the battery in your EV in the same time it would take to pour gas in your car, always wanted to have a piece of the Chinese action. Now, at least there is a first step into China. 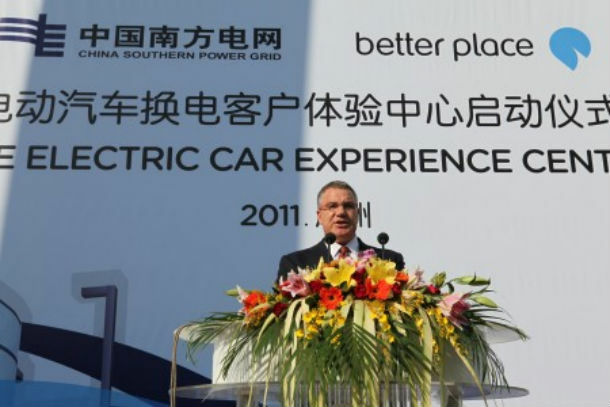 Today, China’s Southern Power Grid (CSG) and Better Place opened their “Switchable Electric Car Experience Center” in China’s southern city of Guangzhou. Nevertheless, it will be a while until you can drive into a station in China’s south, yell “switch ‘er out” (in Chinese) and head for the bathroom while your car is fitted a fully charged battery faster than your hands will dry. However, Proctor reports that there is great interest in the technology amongst China’s automakers. He hopes that the center will “help raise additional interest amongst other players in China"
BMW i is very active marketing its new Electric Cars - advertisements campaigns are all across major European cities now. We have another marketing blast from BMW i Electric Cars division. Fisker Karma is a "star" on "Two And A Half Men" now and BMW will blow your mind with electric cars and supercharged Tom Cruise in Mission Impossible 4. This technology will take us all by surprise how fast people will start to adopt it. Electric Cars are Cool, not toys any more and they are here to stay now. "Something very important is happening these days in the Electric Car space. 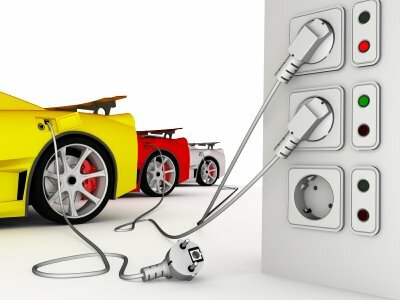 Electric Cars are moving from the Stage One - "Nobody notice and knows about it" to the Stage Two - "It is the Real Threat and we are better to deal with it right now". Everybody has the right to hate, but it looks like some has this right more than others and this right is well greased. Why somebody is so worried? Is it because Plug In Day was organised in more than 28 cities all across US with thousands of people taking part and it is with ONLY two models of electric cars on the market with still very limited supply? Is it because charging stations are mushrooming all across the country and Wall Street Journal complains about it? Is it because Chevy Volt and Nissan Leaf will be finally available in all markets in US by the end of the year? Or the matter to be worried now is that the next QEn+1 is coming and the price of Oil to be going up again? Maybe it is the coming twenty models of Plug In carsto be released next year? Or - we will throw the last one and you can continue - maybe it is the technological progress: with Tesla Model S coming next year with 300 miles range and Toyota announcing the lithium battery with 1,000 km miles range per charge by 2015 with Nissan working on 10 minute charger for the electric cars? An unprecedented campaign in mass media against Electric Cars is ongoing these days. Reasons are all the same: "Electric Cars are dirty, they are very expensive, they are ugly, they are not selling well and there are no places to charge them". Last week the new claims were added to the hating mix - "dirty money and dealings in the electric space": SolyndraGate is taking over the Fisker. Why this old no news was made the news by FOX all over the media we are not sure...maybe it is related to the election "silly season" somehow. The real reasons are much deeper and crucial for us and our ability to go forward: without the clear plan for the Energy Transition not only Wall Street will be occupied very soon. Next round of Inflation and Oil shock will place all society on the edge of the social break down. We still have the time and can vote one electric car and one charging station at a time, make our opinion known or support the companies involved in the Next Big Thing, but we need to have our Manhattan project for the Electric Cars on the state level and we need it now." All you need to know about Peak Oil in one video.